Alkali & Detergents Transfer Pump w/3' Discharge Hose | U.S. Plastic Corp. These hand pumps will eliminate the lifting and tilting of drums and carboys. The body and shaft are constructed of a special polyvinyl chloride with the valves and patented seals of CSM. The pumps in this series are 38" long with a diameter of 1-1/2" and deliver 28 oz. per stroke. These pumps are self-priming and will not siphon. They operate by lifting action only - no pressure hazards. 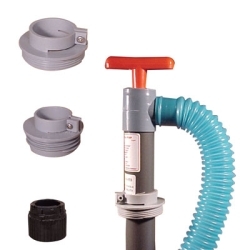 Pumps are available with variety of adapters to fit most any containers. Choose between 3 and 6 ft. discharge hose. One-piece molded, flexible discharge hose is 1-1/4" I.D. and constructed of copolymer polyethylene. Pumps will withstand temperatures to 135°F. This series is designed to transfer detergents, waxes, alkalis, and certain acids.